It's official. The smash hit disease game is on its way to Google Play. It's a happy day for Android users. Ndemic Creations officially revealed plans to bring its surprise hit iOS video game, Plague Inc., to Google Play. Yes, disease for everyone. To make this happen, Ndemic partnered with Miniclip to work on the port, which debuts sometime this month. Even better, the developers will utilize Miniclip's proprietary X-Port Genie technology to update the iOS/Android versions simultaneously via a single code base. 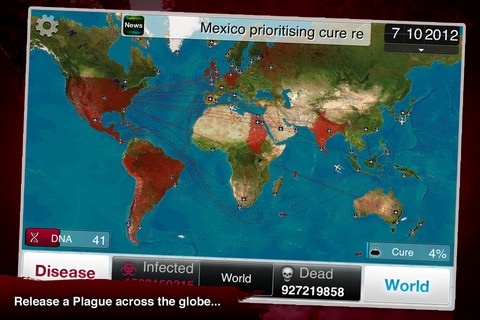 "Plague Inc. has been one of the biggest mobile indie successes of 2012. It is an extraordinary game that fits in perfectly with our current diverse library of mobile games, and through our technology, we can continue Plague Inc.'s phenomenal iOS success by quickly bringing it to Android in just a few weeks when it normally takes months," said Sergio Varanda, head of Miniclip Mobile Division. "Ndemic's decision to partner with Miniclip to bring its game to Android demonstrates the amazing value that Miniclip can bring to indie game developers who wish to quickly and cost effectively distribute their iOS games on Android." "Miniclip's technology and industry expertise made them the right partner to bring Plague Inc. to Android," said James Vaughan, founder and CEO of Ndemic Creations. "Plague Inc. captivated iOS players earlier this year, performing beyond expectations, and we now expect big results for the game on Android." Good news all around. We'll keep you posted on Plague Inc. Android's official release date.